Of all the collaborations that I currently have on my plate, this is one of my favourites: I was asked by Christiaan of FM3 to design and knit Buddha Machine socks and mittens for both him and his bandmate Zhang. 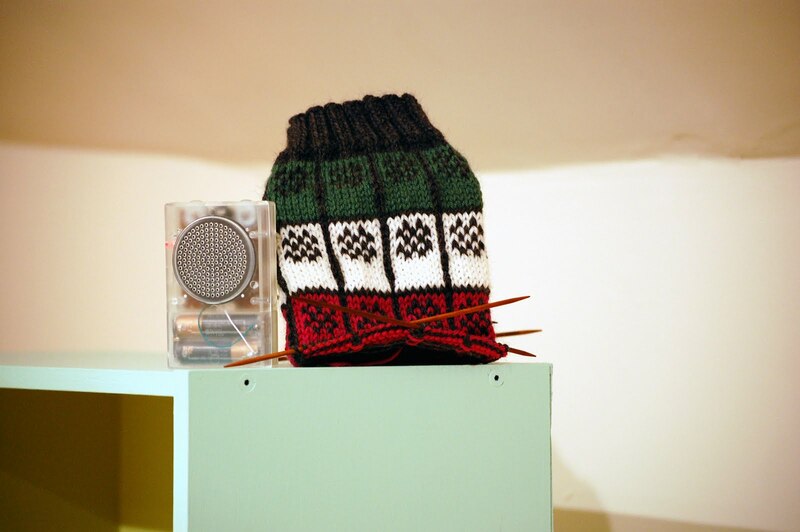 It's not every day that a very cool Chinese avant-electronic duo turns up commissioning handknits. As a Buddha Machine enthusiast myself, how could I refuse? Here's the first of the socks-in-progress posed with my Buddha Machine (it's a Chan Fang.) The mitts will follow shortly. If you'd like to experience the lo-fi joy of the Buddha Machine for yourself, as they say, there's an app for that. It's well-worth the dollar price tag to have an infinite amount of music at one's fingertips. I'm so intrigued by the Buddha Machine; I've never heard of it before. That sock is looking super cute! February 24, 2011 at 11:22 a.m. Thank you! You should really look into the Buddha Machine -- it really is a fascinating and indispensible device. February 24, 2011 at 3:06 p.m.
Love the Buddha Machine!!!! Can you download your own music choices to it as well as listen to their ambient tunes? February 24, 2011 at 3:10 p.m.
VdV -- I'm happy to hear it! Glad you like the socks, as well. The beauty of the Buddha Machine is that it comes pre-loaded with (in the case if the first two versions,) nine ambient loops or (when it comes to version three, called Chan Fang,) four classical loops. You don't need to add anything at all! It's all there -- a perfect, self-contained lo-tech anti-iPod. February 24, 2011 at 3:45 p.m. Sounds amazing--nearly amazing as the matching sock you're designing for it. But where the heck do you get something like this??? February 24, 2011 at 3:54 p.m.
Deb -- Thank you! Here is a list of places to buy them. I ordered mine from Insound. February 24, 2011 at 3:58 p.m.
February 25, 2011 at 9:23 p.m. So creative and such excellent work! February 27, 2011 at 9:33 p.m.